We usually escape to Charleston, SC (see my posts) when we tire of winter, but decided to visit Savannah this time for a change! Both cities are just a 2.5 hour direct flight from Boston, which is about the shortest trip that can get you notably warmer weather in Feb / March. We did not rent a car in Savannah, and absolutely loved walking through the charming parks and squares every few blocks. There was so much that we didn’t get to do or eat this visit for a number of reasons, but that just means we’ll have to go back! Have afternoon tea at Gryphon Tea Room, a converted old apothecary run by local students. I’m not eating dairy or eggs right now after Nori tested positive for allergies, so this visit to the South was rife with food temptations (oh how I crave a flaky, buttery biscuit)! 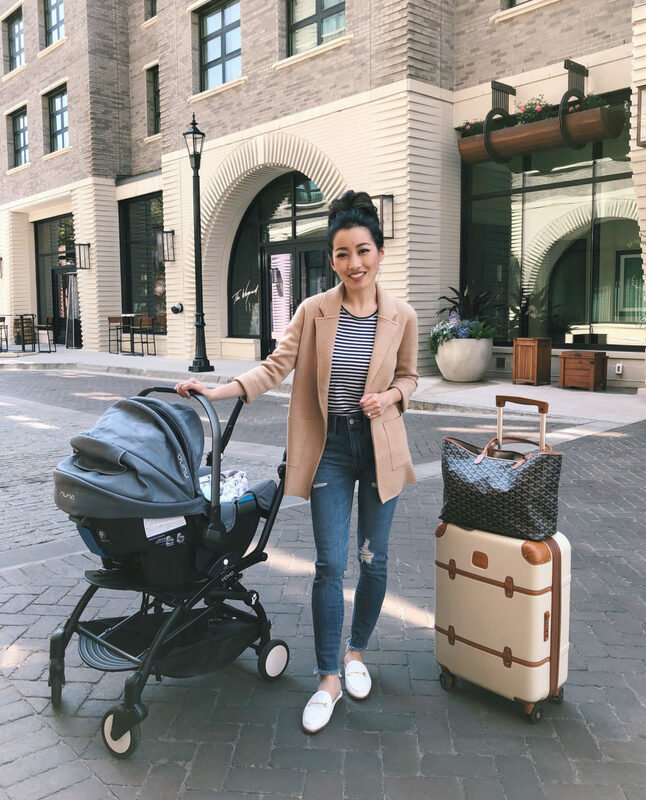 I had to save more indulgent meals and fancier spots for another time, but scroll down to the bottom of this post for casual, family-friendly places that we went to this time with a baby in tow. I found my white dress (my review) at Bloomingdales, Lord & Taylor, and Dillard’s in sz 0 & up! Black is on sale here. My friend recommended this newer hotel that opened just last summer. It’s a beautiful classic property, with modern touches and great marble bathrooms. We loved our stay (in disclosure, we booked at a press rate) and would definitely go back. The hotel has a rooftop bar that’s open to the public, and a small rooftop pool that’s for guests only. We were able to walk to lots of places, including to Forsyth Park, the riverfront, half a dozen smaller parks, and plenty of shopping! They also have a house car for complimentary rides within a 2 mile radius. You can find my last post on flying with a newborn here. Four months later, we still packed and used pretty much the same stuff, except now that Nori is eating solids 3x a day yet can’t sit up on her own, that certainly added to the list. I brought our foldable booster chair (stuffed it along with diapers inside our giant carseat bag, which is free to check or gate check), this travel brush / drying rack + feeding tools, some avocado and bananas, and a few food pouches. I was thankful for my mom who met us there, and helped watch Nori while Nick & I worked! Before traveling I’ll usually ask the hotel or apartment rental if they have cribs or pack n plays, and a lot of them like Perry Lane actually do! I always make sure to bring our own crib sheets though washed in free & clear detergent, and I was also told the scent of “home” serves as something familiar for your baby. A Savannah institution! The service was SO beyond friendly, reminding me what I love so much about the South. I saw bananas behind the counter and asked how much since I was trying to find one for Nori, and they said they were not for sale but kindly just gave me some : ) I had the yummy dairy-free coconut ice cream, and Nick was extremely pleased with the Thin Mint (both seasonal flavors). There was a gentleman in front of me who said he’s been ordering their shrimp salad sandwich for the past decade or so, so of course I had to get that too! The line supposedly gets very long, but we went when they opened and there was no wait. As non-vegans, we surprisingly liked the food here so much that we went twice! The oat milk pancakes are fluffy heaven, the lattes are delightfully creamy (with good coffee, according to Nick), and everything else was flavorful and filling without leaving you feeling heavy. Be sure to get some of the affordable chocolate chip cookies to go! It seemed pretty touristy here, but I wouldn’t call it a tourist “trap” since the affordable fish & shrimp tacos with slaw and house sauce (3 for under $9) were actually a big hit with my mom and Nick. They’re not authentic tacos, but a very tasty way to eat the fried seafood. My mom kept wanting to go back for more! South African sandwiches and rice plats at a casual take-out style joint. We had their popular “Conquistador” chicken sandwich with a variety of their (dairy free) sauces, and found that to be super flavorful with great bread. None of us liked the other popular “Boerewors on a Roll” sausage sandwich though. I’d get the chicken over a rice plate with sides next time! A bunch of you suggested Vinnie Van Go-Go’s – unfortunately we didn’t make it there, but we were pretty pleased with Mellow Mushroom by our hotel. I know it’s a chain, but it was my first time at one and it hit the spot! After going dairy-free for Nori, I don’t even bother with vegan “cheese” on my pizza anymore since it’s usually so thick and gloppy (not a fan of Daiya “mozzarella”). But the staff here convinced me to try the brand that they use (Follow Your Heart) and it was delish and melted like real cheese! Oh my gosh! When I saw that you visited Savannah, I was on Spring Break that week (I go to SCAD) and I am so sad that I miss you. I wanted to meet you when you went to my favorite cafe (The Paris Market)! Well I am glad you had an amazing time and definitely come back! I’ve used so many of your posts as outfit inspiration over the years. Thanks as always for the great tips and ideas!! I was wondering if you could maybe do a post with Anthropologie clothes and come up with some colorful spring/ summer outfits? I would love to see what you could come up with! Hi Manda, thank you for your kind message! I love Anthropologie and their petite items, unfortunately they just don’t carry a large number of items in small petite sizes and they are always the first to sell out! I hope they’ll carry some deeper inventory in those sizes since I’m sure a lot of us are interested! I love the sweater blazer from Jcrew. Many comments said that the blazer pilled after one wear. I’m interested to hear your experience. Awww you and your little Angel wearing matching swimwear is the cutest thing ever! Love ♥️that! Your pictures look amazing as always and i of course love all your outfits! The Grey is definitely on my list of restaurants after watching the Chef’s Table episode. What a cute little vacation! I’ve never been to Savannah but now you’ve put me onto the fried seafood and ice cream! Could I ask where your sunnies are from? Escaping the winter for a short break feels amazing doesn’t it?? I see you had a wonderful time and you look super lovely in all your looks! Nice traveling post on Savannah. I have never been but was considering for my 40th. I am a big fan of jumpsuits so I have to give props to the white one you featured. Express items have a fit weird on me but will need to give this one a try! Btw, I love your matching swimsuits with your little one. Shall I say? You are both rocking this look! Hi Suzy! I’m not the best person to ask to be honest since my baby isn’t quite mobile yet, so I haven’t been on the lookout for activities for little ones. I think Charleston may have more to do since there are beaches within a short drive, however it’s not swimming weather in the ocean this time of year. Hi! I’m a new follower, love the blog! I also had allergy issues with one of my kiddos (dairy, soy, eggs, and beef) and wanted you to be aware that a lot of bread products (especially processed bread as compared to homemade bread) has dairy-based additives. It’s hard but it’s so worth! Kudos to you for powering through! I always love your travel diaries, Jean! So many great tips and advice about Savannah! Thanks for sharing! When I read that your daughter suffered from reflux and eczema, the first thing I thought of was allergies, having had gone through those symptoms myself. It can be daunting at first, I would spend hours researching and agonizing over the what if’s. It does get easier with time and joining FB and other online groups really helped. As another commenter commented, milk comes under a bevy of derivative names and can take weeks to clear your milk and baby’s system. I really applaud your decision to go dairy free ( soy is a common one also, Bc it’s similar to milk -usually people start by eliminating dairy first, then soy if no improvement) and please have lots of grace on yourself in the process!! Your daughter is beautiful and you are such a wonderful mom. Thank you so much mama for the info and the encouraging message! I LOVE Kelly Mom … what would we do without this resource? Looks like you had an amazing time in Savannah! 🙂 I always love your travel posts because you eat at the best places <3 🙂 And loving all of these outfits as well! I’m glad you enjoyed being in Savannah, it looks like it was relaxing and had some very scenic locations. The whole family looks happy and glad to be in a new place. Your outfits are beautiful, southern flair and modernly put together. You truly help petite women to look well dressed in so many different ways. Very inspiring. Hi Jean! I love love love your style and blog! I was wondering what do you do with clothes when you no longer needed? Do you sell it? :_) Thank you! Lovely travel diary….love all your outfits. The floral dress one is so pretty. I also really like the white jumpsuit on you, so elegant and sophisticated. Your baby girl and you wearing matching swimwear is the sweetest thing I’ve seen in a while. My husband & I are going to Savannah in June so loved seeing this post! I also spied an Elvie pump- would love to hear your thoughts on it, reviews are hard to find! Love those mules you have. Just wanted to know more about its ventilation. Does it get warm in them easily because of the material or are they quite “airy”?